Here at Spray Clad UK we have the most up to date technology available for providing our customers with first class technical support. We offer free consultancy advice to all customers and as we have an excellent relationship with all panel manufacturers we are able to offer the best and most appropriate advice on solving your problems. 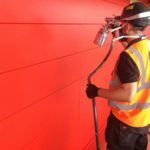 Our staff are extremely experienced in all different substrates and therefore know the best coatings and treatments to use for each job. We consider every job to be unique and always carry out a full survey to ensure the end result is of the highest standard. WE use the latest technology including drone surveys to assess buildings and panels and then put into place a custom action plan making recommendations to the customer and ultimately carrying out these recommendations to solve problems, repair panels and much more. 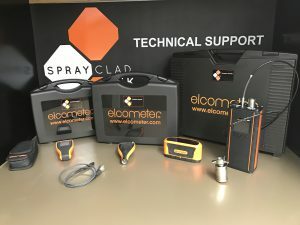 SprayClad UK like to be at the forefront of our industry and use the latest technology to assist us in our every day operations with the latest computer equipment in our offices, booths, labs and on site. We have various aids such as electronic micron meters and non destructive adhesion testers right through 4K drones which we use to survey works. 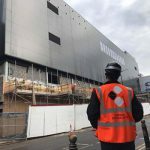 Our operatives carry CSCS / SSSTS, IPAF, PASMA, Asbestos Awareness Certificates, Working at Height Certificates, Face Fit Certification, Emergency First Aid and LUCAS. We also have within our ranks ICORR level 1 Paint inspectors and fully licensed (insured) drone flight operatives. By the end of 2017 SprayClad UK have committed to being accredited and associated with Safe Contractor, CHAS, SMAS, Construction Line, ISO 9001, ICORR and iCATS.